Set in a quiet location on a hill, these well maintained, light, airy, spacious studios and apartments offer pretty views over Pefkos bay and are well located for enjoying the resort facilities. We booked accomodation direct through website. The hotel is all newley painted with a brand new pool area. We requested a sea view room with balcony and that is what we got. The view was fabulous. The apartment was on sencond floor and very spacious with a balcony. Had a full bathroom. The main area had 3 single beds, wardrobe, drawers, dressing table, small dining table and chairs. A two ring hob, kettle, snackwich toaster, fridge, adequate cutlery and pans, fridge and most important air conditioning. Although we only made coffee and tea in the apartment we made use of the fridge with keeping the wine cool. The sheets on bed were changed once during the week and towels twice. All the staff were brilliant and couldn't do enough for you which we found really great. We were two mature ladies taking a break from our families and we had a fabulous holiday and would definately go back next year but maybe for a few days longer. Ignore the negative reviews about these apartments. They have been refurbished and are fantastic, light and airy, with great views over Pefkos Bay. There is a pool just below the apartments, with plenty of sunbeds and shades. The poolside is kept very clean. Angel Bar which is below the pool, serves snacks all day and is a great place to meet in the evening. 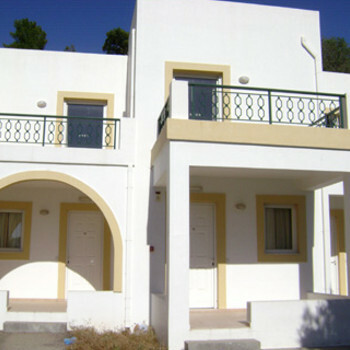 We have just returned from Nikitas and would definately recommend these apartments. Booked this holiday in February 2007 so not a last minute cheapy!! Room was in old block of Nikita Studios and extremely dissappointing to say the least. Area outside entrance was unclean with cigarette stubs lying around, concrete platform rather than terrace or balcony as described in brochure, with views obscured by unsightly wasteland. Bedding was not changed at all, towels changed once despite being told by rep linen would be changed twice - bins were emptied daily. Studio was tatty, dusty and unkempt. Crockery and cutley were pathetic, 1 mug and 1 glass in a studio supposedly for up to 3 self-catering!! Would not have considered cooking there although was grateful for an electric kettle to make a cup of tea. Kitchen drawers could not be opened as knobs fell off when touched. Wardrobe drawers contained items from previous occupants. Shower head leaked all over the placed. Asked the owner for one more glass and mug which we were promised but never appeared - he did not seem to be interested. Informed Rep of concerns at welcome meeting and he said he would come and take a look - did not turn up! Seemed strange that the rep was staying in one of the newer apartments which we were told were not available! We were provided with a complaint form but could not locate rep to sign therefore gave up on process. Pefkos is a lovely resort - our accommodation was rubbish. Would not book with Libra again or use Nikita studios again but would visit Pefkos again. The studios in Nikita 2 are basic but large. There are pretty views across the bay. This is a great base for a relaxed holiday. 2 mins walk to good bars and restraunts. Only 10 min walk to lovely beach. You can use pretty much any pool we preferred Oasis and Kelari (good food and service). We stayed in nikita 1 the old block appartment 4 which was on top floor we had 2 balconys & 2 bedrooms with plenty of room,living area was small table 2 chairs ,fridge,small 2 ring hob ,balconys made up for this if you could stand the heat! Old fashioned and no air con.Excellent veiws short walk to pools beach& bars.Would stay again. We were very impressed with the room for the amount of money we paid, we stayed in nikita 2, it was very clean and bright when we arrived. There was no air conditioning, although fans are available from the local supermarket which is owned by the hotel owners. The staff were very friendly and very willing to help, but they could not speak much english. We stayed for a week and our bedding and towels were changed twice. The location was very good, just a 10 minute walk to the beach with a fantastic view, there is no pool but in pefkos you are welcome to use any pool so that was no problem at all. The only bad point about the holiday was the rep, we only saw him once and when we had an important querie, he was impossible to get hold of! we stayed in nikitas 2. wouldnt say a bad word regarding the staff. they helped as much as they could and were generally very pleasant. more than can be said for our rep. who we never saw. air conditioning and flight times were real downsides. without paying the extra for an extension we would have wound up going 18 hours before boarding our plane. Very basic accommodation for those holiday makers whom simply want a place to rest their head and are not swayed by a personal service, swimming pool, air con etc. However, in Pefkos, you can use other hotels pool's without an eyebrow being raised. The room was presentable and generally hygenic, however new towels/bedsheets were not particularly forthcoming. Accomodation not suitable for children but couples and person's wanting to spend their money on daytime and nighttime activities rather than relax in their accomdation. We stayed in Nikita 1 it was the old building. It was clean the maid came round every day. The location was fine you had a slight hill but it kept us fit and we had a lovely view. The owners were very friendly always giving the kids something free. We had a problem with the fire alarm going off and they came and sorted it straight away. We have booked again for May. We stayed in Nikitas2 which is the newer block and the studio was light & airy & modern. Good facilities - including an automatic kettle & a tea towel! Could have been a bit cleaner (dusty floors & soapy soap dish!) but the bits that mattered were okay - sinks, bedding, towels etc. Beds typical for standard & price of accommodation - uncomfortable! We were on the first floor so had a lovely view over the bay and saw some fantastic sunsets. At the back there is rocky hill and we saw goats every day & bats on a night so a lovely location. The downside of the location is that sound is amplified louder than when on the street - but we only had one night where this was a problem for sleeping - but we were there in low season.